It has been recognized since Mount Auburn’s early decades that the Cemetery’s aesthetic richness, educational value, and historic significance are derived in large part from the remarkable tapestry formed by its diverse collection of monuments and burial markers carefully sited in the landscape. In the nineteenth century, the Cemetery and individual lot owners commissioned a vast array of public art: monuments, structures, and buildings. Visitors, therefore, experienced the site as an outdoor museum as well as a place of burial. Today, Mount Auburn continues its dual mission of active cemetery and cultural landscape by striving to inspire all who visit and commemorating the dead in a landscape of exceptional beauty. While the Friends of Mount Auburn Cemetery has long offered tours and programs to the public, in recent years we have further embraced our role as a cultural resource and have begun working with contemporary artists and art organizations to create original site-specific programming. In 2014, Mount Auburn became the first cemetery in the United States to establish an artist residency program. Our two-year program supports the creation of new work by a contemporary artist inspired by his or her in-depth experience at the Cemetery. The resident artist is charged with creating works for visitors, drawn from their direct experience, that convey a fresh and innovative perspective of Mount Auburn. To date, we have awarded residencies to filmmaker Roberto Mighty (2014-2015) and composer Mary Bichner (2016-2017). Currently, we are delighted to be hosting playwright Patrick Gabridge as the 2018-2019 Artist-in-Residence. 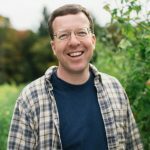 We are excited to introduce Mount Auburn’s new Artist-in-Residence, award-winning playwright and author Patrick Gabridge. His past work includes the plays Drift, Mox Nox, Lab Rats, Blood on the Snow, Fire on Earth, Constant State of Panic, Pieces of Whitey, Reading the Mind of God, and Blinders, as well as the novels Steering to Freedom, Moving (a life in boxes), and Tornado Siren. Here at Mount Auburn, Gabridge’s goals for his residency are to gain a deep understanding of our National Historic Landmark site and to write a series of site-specific plays that will be staged throughout our spectacular landscape. He intends to create work that reflects the spirit of the place and the people who are buried within, as well as those who visit and work on the grounds. Gabridge began his residency in the winter of 2018 with extensive research and moved on to writing as he collected stories and inspiration. Public readings and associated talk-back sessions in the fall of 2018 will help Gabridge further develop the plays for full production in 2019. During her residency, musician and composer Mary Bichner composed a series of new works inspired by Mount Auburn’s breathtaking landscape and landmarks, using her sound­-to­-color synesthesia to select the musical components that best “match” the natural color palette of each location. As Ms. Bichner completed her compositions in 2016, she participated in a series of “pop-up” concerts and gave talks about her artistic process. In early 2017, her Mount Auburn compositions were professionally recorded. Ms. Bichner completed her residency with two sold-out concerts in Story Chapel. 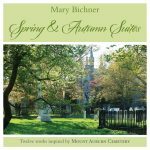 Mount Auburn: Spring & Autumn Suites, the product of her Mount Auburn residency, is now available as a free digital download. Cemetery visitors may also experience Bichner’s music in the setting that inspired it through Mount Auburn’s Visitor app. 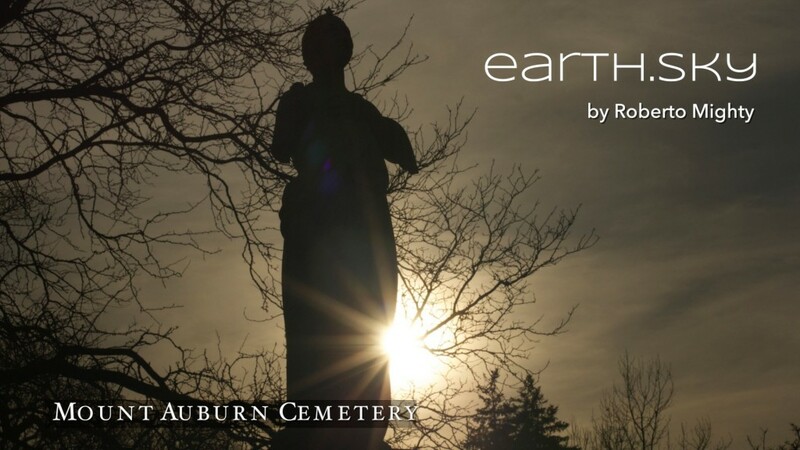 Roberto Mighty, Mount Auburn’s inaugural artist-in-residence from 2014 through 2016, drew inspiration from the sights, sounds, and individual stories of the Cemetery to create earth.sky, an immersive meditation on life, death, ritual, history, landscape, nature, and culture. The original version of his project, designed to be screened in Mount Auburn’s Story Chapel, premiered in full in November 2016. To make the films, music, images, and storytelling of the original exhibit available to audiences worldwide, Mighty completed his residency with the release of an online version of his project.